Bloomberg has published its 2018 innovation index, and Korea ranked first followed by Sweden, while the U.S. dropped out of the top ten. 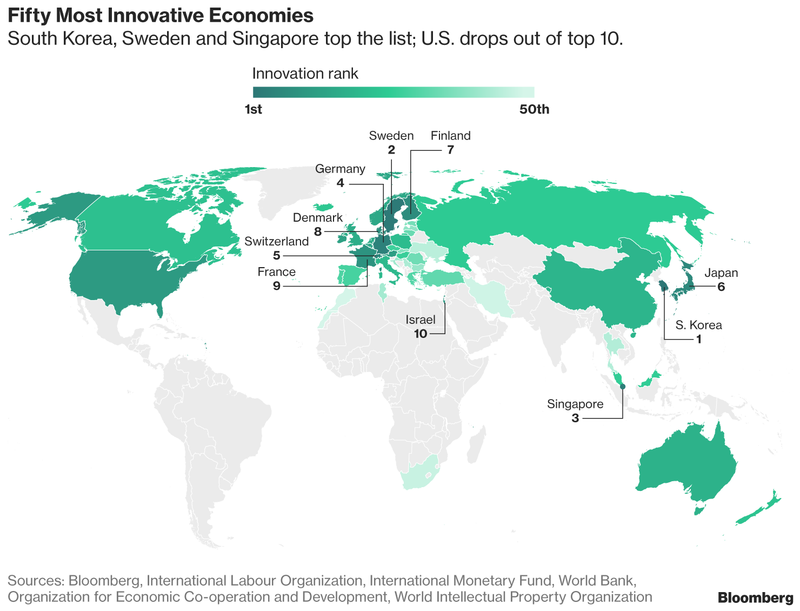 As noted by Bloomberg Technology, "South Korea remained the global-innovation gold medalist for the fifth consecutive year. Samsung Electronics Co., the nation’s most-valuable company by market capitalization, has received more U.S. patents in the 2000s than any firm except International Business Machines Corp. And its semiconductors, smartphones and digital-media equipment spawned an ecosystem of Korean suppliers and partners similar to what Japan developed around Sony Corp. and Toyota Motor Corp." The U.S. ranked 11th. The index is comprised of measures of R&D intensity, manufacturing value-added, productivity, high tech density, tertiary efficiency, researcher concentration, and patent activity.